Beards are awesome. They give you that rugged and manly look and help protect your face from the elements as well. And for some of us at least, they help our faces look more presentable by hiding the ugly bits! But for all the good that they do, beard maintenance can be a real chore. What is a beard shampoo? 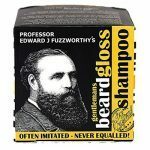 What is the difference between regular shampoos and beard shampoos? How To Identify A Good Beard Shampoo? Beards need a fair amount of ﻿﻿﻿attention ﻿﻿﻿and care. They are dirt magnets, sponging up all kinds of detritus all through the day. From the dust and pollen in the air to fragments of what you eat, to your dead skin cells, a lot can get into that thick growth of hair under your chin within a day. But beards are big business these days. When you have a craze, there are always companies looking to cash in. And beard grooming and maintenance products are the in-thing these last few years. There are hundreds and hundreds of products on the market, ranging from beard brushes to combs, beard ﻿﻿﻿oils, shampoos, and conditioners. Let’s train our eyes on beard shampoos for now. Are they really that different from ordinary hair shampoos? Why should you buy shampoo just for your beard? What are the traits of a great beard shampoo? We will address all these questions in our Beard Shampoo FAQ and Buying Guide, and then pick out some of the best shampoos in the market right now in our reviews section later. To successfully grow a long and majestic beard, you need to ensure that it is healthy and clean. And you can’t properly clean a beard using just water and normal shampoo/soap. The beard hairs are greasy and oily, just like the hair on your head, and require frequent washing. The combination of dead skin cells, dust, dirt, oil and random detritus can result in foul odors and risk of fungus and dandruff. You need proper cleaning agents to remove all this, and a bead shampoo is something that is designed specifically to clean your beard. But if beard hairs are like normal hair, why not use a regular shampoo right? No, and this brings us to the second question. The combination of dead skin cells, dust, dirt, oil and random detritus can result in foul odors and risk of fungus and dandruff.You need proper cleaning agents to remove all this, and a bead shampoo is something that is designed specifically to clean your beard. We said that beard hairs are similar to the hair on your head, not identical. There are several significant differences. Since it is on the front of your face, beard hairs are more prone to getting dirty, especially thanks to the food you eat. And the nature of the hairs is also quite different. Your regular hair tends to be thinner and smoother than beard hairs which, being thicker are more prone to split ends. And the skin on your face is also quite fragile and sensitive when compared to your scalp. Regular hair shampoos are equipped to deal with dirt effectively, but they often contain harsh chemicals. 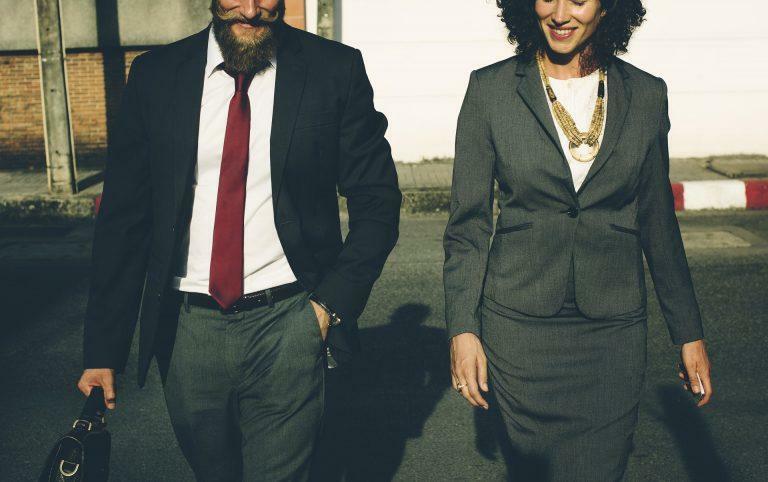 Chemicals can affect your beards in two ways. ​They can cause irritation to the skin on your face. ​​They strip away the natural oil (sebum) that provide a protective coating to your skin and beard hairs. These ingredients, which they contain can damage the essential oil balance in your beard. And this effect gets much worse the longer your beard gets. For you see, the sebaceous glands in your skin are unable to give full protection to the entire length of your beard hair once its starts getting long. And when you use harsh chemical shampoos with ingredients like Sodium Lauryl Sulfate (SLS) and parabens, they strip away what little sebum protection your beard has, leaving it dry and vulnerable to dandruff and flaking. When you take a look at some of the common ingredients used in cheap hair shampoos, you can’t help but realize that many of these products are not fit enough for use on your head, let alone your beards! 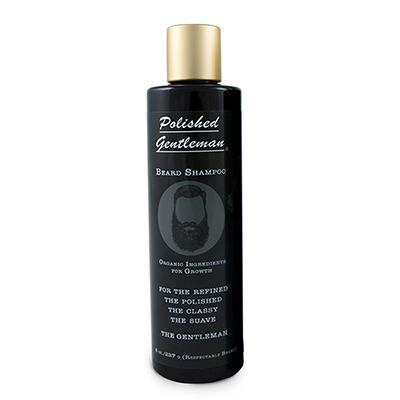 The way they handle sebum is what distinguishes good beard shampoos from ordinary shampoos. Sebum i​n moderate amounts is vital for healthy skin and beard. And as we already mentioned, longer beards lack adequate sebum to help maintain healthy moisture content in your beard. Beard shampoos are formulated with natural ingredients and gentle soaps that help preserve more sebum. They also contain higher quantities of essential oils to make up for any deficiencies that longer beards have. Essential oils serve a dual purpose: not only do they protect beard hairs and skin, but they also tend to have fragrances, which are much safer than harsh chemical fragrances. Common essential oils include sandalwood, patchouli, and tea tree, among many others. 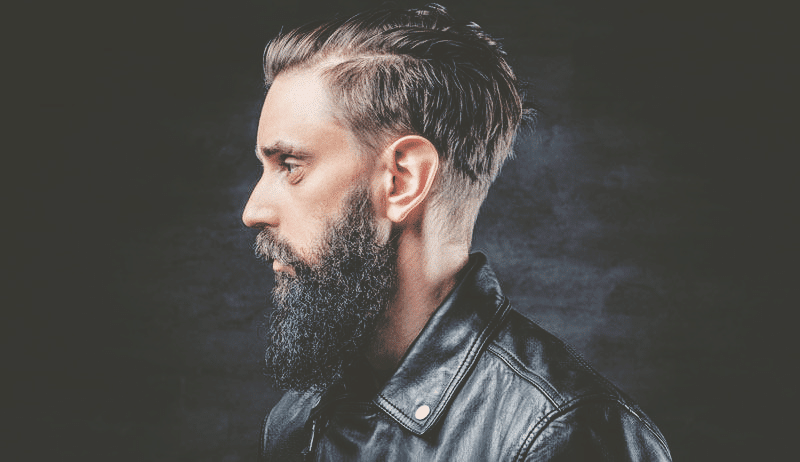 ​Natural Ingredients: this is the main factor that can make the difference between a dry, itchy, flaky beard and a shiny, clean, majestic beard. ​Lather and performance: while it should contain safe ingredients, a beard shampoo also needs to have adequate lather and foaming capacity to help remove all the stubborn dirt and detritus that gets lodged in your beard. ​Scent: when you are washing something that lies immediately under your nose, you need something that smells nice, and more importantly subtle. Strong smells are rather undesirable for obvious reasons. Also, if you use a beard oil and balm, a strong overpowering scent can actually cause a headache. As for things to avoid when buying a beard shampoo, just take a look at the ingredient list on the packaging. If the product contains any of the following chemicals, you might want to put that shampoo down and look elsewhere. ​Ammonium Lauryl Sulfate, Sodium Lauryl Sulfate, and Sodium Laureth Sulfate: they remove all the sebum and can cause dandruff and irritation and may be ﻿﻿﻿﻿﻿carcinogenic﻿﻿﻿﻿﻿. ​Polyethylene Glycol/Propylene Glycol﻿: petroleum based products that may contain dioxanes, known carcinogens. ​Diethanolamine (DEA) and Triethanolamine (TEA): used to provide lather in shampoos, they are also used in brake fluids and antifreeze! Associated with cancer, miscarriages, and inhibition of fetal development in the womb. ​Contains no harsh chemicals, only all-natural ingredients. ​Beeswax helps retain sebum and maintain oil balance. ​Essential oils provide nourishment to your beard. ​The scent is mild and quite masculine. ​The solid bar can last for quite some time. ​Keeping the bar dry after use can be a hassle since it has a tendency to dissolve quickly when wet/humid. ​Takes some time to wash out the thick lather. ​Leaves a slight residue on the beard after washing. ​With a striking period design and catchy name, this is one of the most popular products available online. The actual product is a shampoo bar, quite rustic in appearance with a very blocky shape. The best thing about the Professor’s shampoo bar is the complete absence of any of the chemicals we have mentioned in the guide above. The ingredient list contains some exotic natural ingredients from Down Under, including stuff like Mount Wellington Spring Water, Tasmanian Seaweed Extract, Leatherwood Honey, and Beeswax. ​Can last up to 3 months if you use on alternate days. ​Pleasant fragrance is quite mild and reminiscent of old-school barbershops. ​Not great at keeping your beard hydrated, some people complain of excessive dryness after use. ​Contains chemicals and artificial scents can cause allergies for some people. 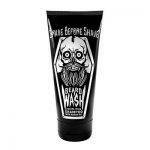 ​With a grinning bearded skull on the front, this shampoo scores high on the design and packaging. Unlike the previous shampoo, this one is in regular liquid form. 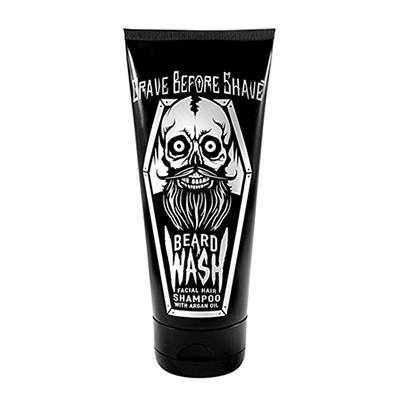 Though it contains many chemical ingredients, Grave Before Shave does not include any of the harsher stuff like ALS, SLS or parabens. The chemicals are generally of a milder nature, but it does contain artificial parfum fragrances. The shampoo is enriched with natural argan oil and olive oil, as well as coconut oil extracts. ​Has an effective cleansing power. ​All natural ingredients without any harsh chemicals. ​Contains several different essential oils. ​Has a pleasant smell that is not too strong or overpowering. ​Doesn’t lather as much as other shampoos. ​Underwhelming impact despite a large number of ingredients. ​With a mild olive oil based “Castile” soap as its base, this shampoo from Polished Gentleman emphasizes the importance of all natural ingredients. Though the ingredient profile is pretty long, it doesn’t seem to contain any of the toxic stuff commonly found in cheap shampoos. Some of the notable ingredients include aloe leaf juice, coconut extracts, rosemary and eucalyptus oils, argan oil, peppermint oil, and honey. ​Lathers well and doesn’t leave any residue. ​Leaves a healthy shine and soft, flake-free skin and beard. ​Can last long, since only a drop is needed for one-time use. ​The fragrance is kind of woody and sweet, and very faint. 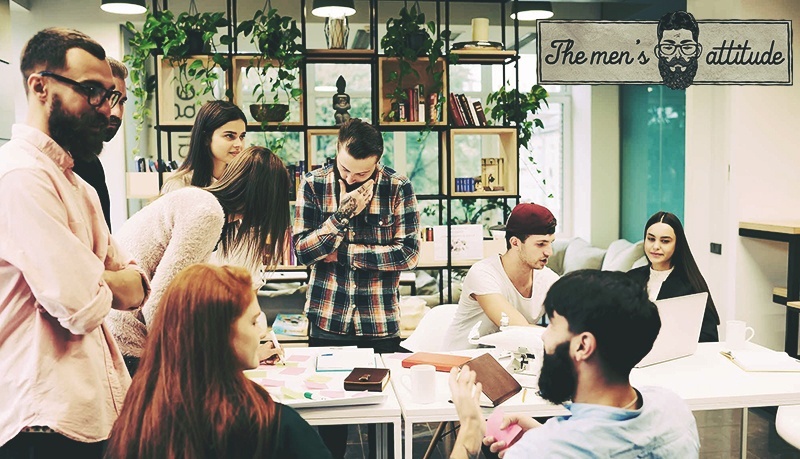 ​Many customers find no positive impact on use. 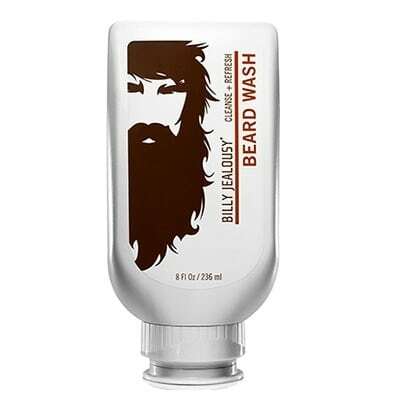 ​Billy Jealousy is a very popular brand among bearded men, with a range of grooming products including this liquid beard wash shampoo. The formula is free from harmful chemicals like sulfates and relies on the nourishing power of aloe vera. But it does contain some chemicals, like butylene glycol and fragrance, and might be unsuitable for individuals with sensitive skin. Other safer natural ingredients include soy protein, green tea extract, and honey extract. 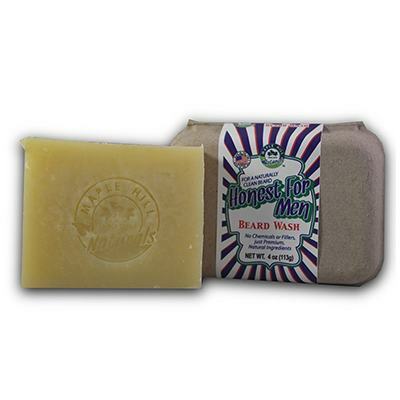 The liquid shampoo is easier to apply and store than other products in bar soap forms. ​Comes with a handy recycled paper container for storage. ​Contains no harsh chemicals, but has a very varied list of essential oils. ​Handcrafted product with no animal testing. ​The smell is quite sweet and natural. ​The lather is very rich. ​Leaves the beard feeling a little dry. ​The fragrance though nice is on the stronger side. ​The second bar soap in our list is a highly rated product with good value for money. As claimed by the manufacturer, the ingredient list does not contain any “names you can’t pronounce,” meaning no complicated chemicals are part of the equation here. What it does contain is coconut oil, palm oil, hemp seed butter, shea butter, essential oils like avocado, jojoba, patchouli, lavender and orange. The soaps are handcrafted and have a very rustic feel. There are a lot of brands trying to cash in on the beard craze these days. Based on our tests, most of the beard shampoos do a decent job when it comes to removing dirt and dandruff the beard. But when it comes to enriching the beard hairs and maintaining the natural oil and moisture balance, the performances tend to get patchy. Even when it comes to some of the best best beard shampoo brands on the market, the moisturizing impact is relatively on the low side. In our opinion, if you have a short beard (under half an inch thickness), you shouldn’t need shampoo in the first place. And if you are planning to grow your beard really long, don’t expect the shampoo to do all the work as far as nourishing is concerned. You will need a good quality beard oil/balm to get the best out of your beard. 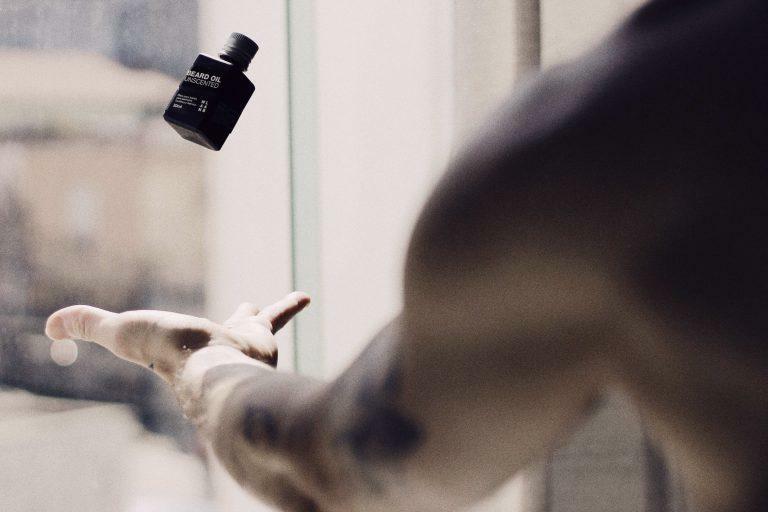 When you look at the best beard shampoo, what you should expect is a product that doesn’t harm your skin and one which doesn’t strip away too much of your natural oils. 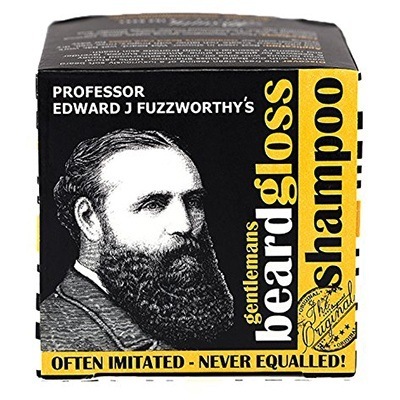 In this regard, we feel that Professor Fuzzworthy’s Beard Shampoo is a top choice. It contains no harsh chemicals and comes in a durable bar soap form. The inclusion of beeswax and essential oils help improve the nourishing powers of this shampoo bar, and it provides some level of moisturization as well. Use in conjunction with a high quality beard oil for best results.